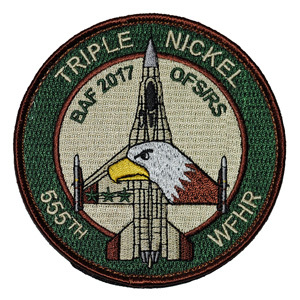 On October 31, 2017, Renzo Del Bianco witnessed the return of the 555th Fighter Squadron "Triple Nickel" to Aviano Air Base following the completion of their 2017 deployment to Afghanistan. 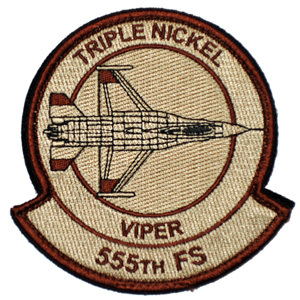 At the end of October 2017, the 555th Fighter Squadron “Triple Nickel” completed its six-month deployment to Bagram Air Base, Afghanistan. The airmen and F-16C Fighting Falcons of the 555th Fighter Squadron from the 31st Fighter Wing deployed to Bagram Airfield, near Kabul, Afghanistan, as the 555th Expeditionary Fighter Squadron. As part of Operation Freedom’s Sentinel, the deployment provided the permanent presence of a fighter unit on rotational basis in the Afghan theater, replacing the 79th Expeditionary Fighter Squadron from Shaw AFB, South Carolina, in late April 2017. 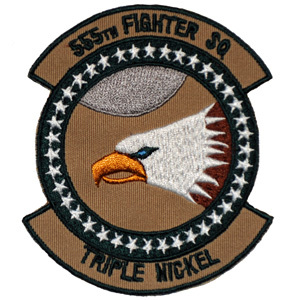 The 2017’s deployment was the fourth in Afghanistan for the “World Famous Highly Respected” 555th Fighter Squadron “Triple Nickel”. The squadron first deployed to the region as part of Operation Enduring Freedom in 2004 (from February 28th to June 5th) and again in 2011 (from April 13th to October 12th). In 2015, the green tail striped F-16Cs returned to the Afghan skies to support Operations Freedom’s Sentinel and Resolute Support. Operation Freedom’s Sentinel is the counter-terrorism mission performed by the United States to rid the region of remnants of al-Qaeda and other terrorist groups. It is a complementary mission to Operation Resolute Support by NATO with the purpose to train, advise and assist the Afghan Forces. Both operations are successors to Operation Enduring Freedom, which lasted more than 13 years, from October 2001 until December 2014. The 455th Air Expeditionary Wing, one of the main units of the United States Air Forces Central Command, is at the forefront in support of Operation Freedom’s Sentinel. USAFCENT, as well the 455th AEW for its area of operations, is responsible for air operations, either unilaterally or in concert with coalition partners. 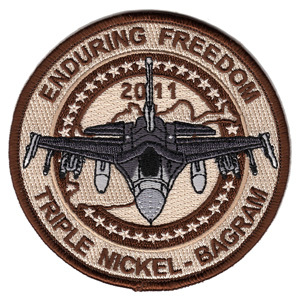 The “Triple Nickel” F-16s provided the 455th Air Expeditionary Wing with a dynamic close-air-support capability, covering from the sky for Afghan and coalition forces on the ground, deterring insurgent forces and allowing freedom of movement for friendlies, as well as the ability to strike enemy structures and weapons caches. 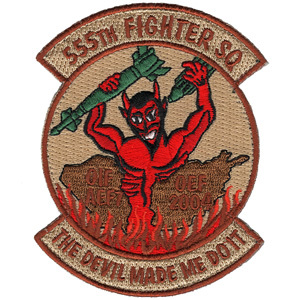 Several other components of the 31st Fighter Wing were also heavily involved with the 555th Fighter Squadron’s deployment. 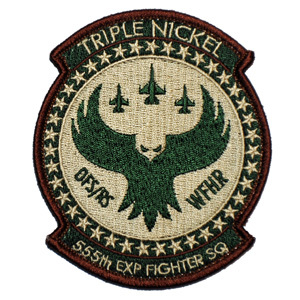 Among these were the 31st Logistic Readiness Squadron of the 31st Mission Support Group and the 31st Aircraft Maintenance Squadron of the 31st Maintenance Group, which played an important role in supporting the “Triple Nickel” during the six-month deployment. Just for the start of the deployment alone, the 31st Logistic Readiness Squadron had processed 344 passengers and 237 tons of cargo in 10 days, about a third of the total freight the unit had processed in 2016. The airmen of the 31st Maintenance Aircraft Squadron were part of approximately 380 airmen from Aviano AB that deployed to Bagram Airfield to support the 18 F-16C Fighting Falcons, in cooperation with the resident personnel of the 455th Air Expeditionary Wing. During the 2017 deployment, an important milestone was achieved by the Commander of the 555th Expeditionary Fighter Squadron, Lt. Col. Vincent O’Connor, who surpassed 2,000 career flight hours on May 19, 2017. Having landed at Bagram, Lt. Col. Vincent O’Connor received his commemorative patch to immediately put it on his flight suit having just parked the F-16C. 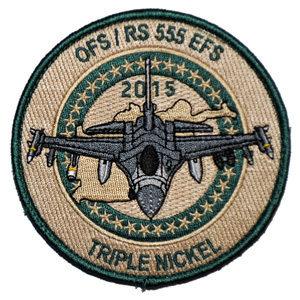 The 555th EFS “Triple Nickel” was replaced by the 77th Expeditionary Fighter Squadron “Gamblers”, from the 20th Fighter Wing. 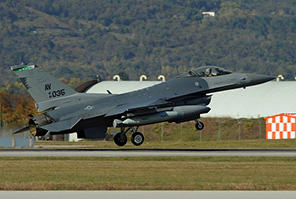 Deploying from Shaw AFB, South Carolina, the 77th EFS F-16Cs had arrived some days before the “Triple Nickel” left the Afghan theater to return to Aviano AB, Italy to ensure operational continuity even during the handover. After a non-stop flight with aerial refueling, two formations of six aircraft each landed at Aviano AB early in the afternoon on October 31st. A large group of familiars and friends welcomes them upon their arrival. The remaining six F-16Cs followed on the day after. All pilots showed off their mustache grown while deployed, as tribute to Colonel Robin Olds, the U.S. Air Force ace and legendary Commander of the 8th Tactical Fighter Wing, to which the “Triple Nickel” was assigned during the Southeast Asia TDYs in Thailand at the RTAF Udorn and RTAF Ubon air bases. 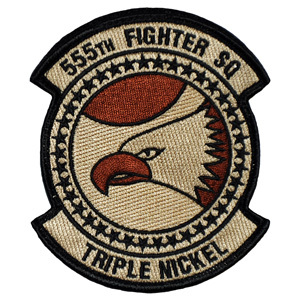 From 1966 until 1973 the 555th Tactical Fighter Squadron scored the highest number of air combat victories against North Vietnamese MiGs among all U.S. Air Force units the Vietnam war, destroying 39 MiG-17/19/21, gaining the title “World’s Largest Distributor of MiG Parts”. My sincere thanks to 31st Fighter Wing / Public Affairs, Aviano AB, for this opportunity to document the return of the squadron.